Earlier experimental studies by one of us (Kelso, 1981a, 1984) have shown that abrupt phase transitions occur in human hand movements under the influence of scalar changes in cycling frequency. Beyond a critical frequency the originally prepared out-of-phase, antisymmetric mode is replaced by a symmetrical, in-phase mode involving simultaneous activation of homologous muscle groups. Qualitavely, these phase transitions are analogous to gait shifts in animal locomotion as well as phenomena common to other physical and biological systems in which new “modes” or spatiotemporal patterns arise when the system is parametrically scaled beyond its equilibrium state (Haken, 1983). 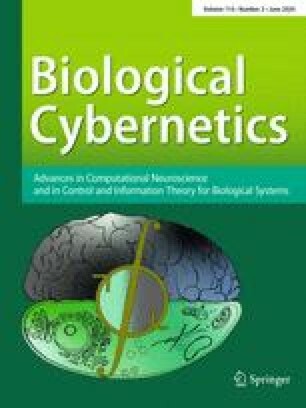 In this paper a theoretical model, using concepts central to the interdisciplinary field of synergetics and nonlinear oscillator theory, is developed, which reproduces (among other features) the dramatic change in coordinative pattern observed between the hands.